IBA Kolding’s new premises will really have a bit of style. 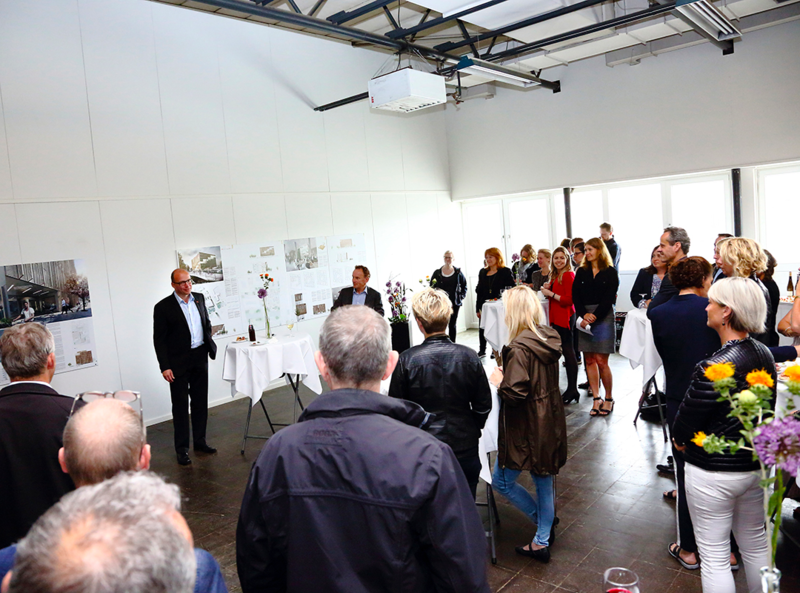 The winning proposal was unveiled at a reception on Thursday 24th May 2016, at the former Gimbelgrund at Sønder Havnegade in the centre of Kolding. The very modern building will eventually stretch all the way down to the brook - and will feature a broad, staggered strip of glass around the exterior, so that students and everyone else at IBA can look out and enjoy the greenery and the view. Passers-by can also see in, able to keep up with the goings-on in and around the building. The address will be Sdr. Havnegade/Østerbrogade – alongside the flowing stream in Kolding. Close to the harbour. Close to the town centre. 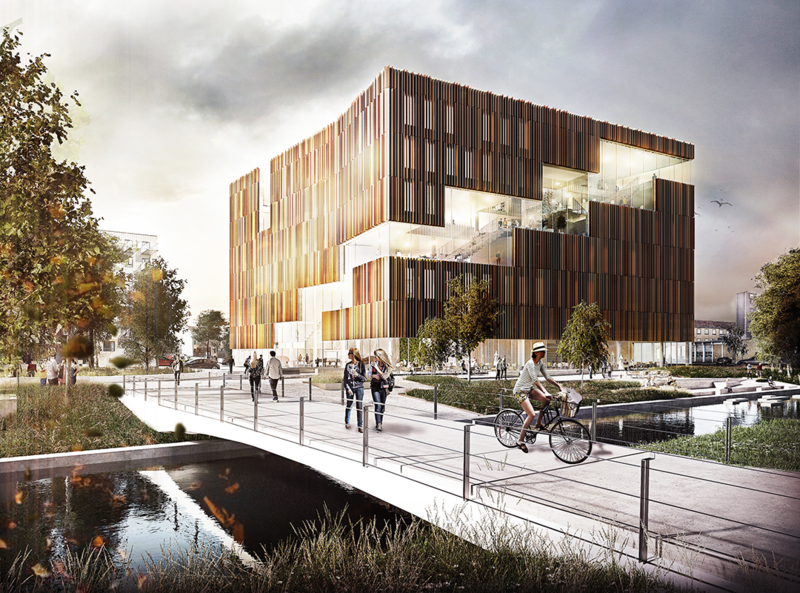 The building will be sustainable, and a part of Campus Kolding. IBA’s construction on this previous ‘Gimbelgrund’ land will eventually cost around 200 million kroner. IBA expects to be able to move in summer 2019. The building will be around 10,000m2, spread over seven floors including the basement level. It will house 2000 students, 150 teachers, plus administrative staff and visitors. The heart of the academy will be the ‘steps of knowledge’, linking up the various different universes within the building. These steps can be seen from the outside. The slats around the building’s exterior are made of anodized aluminium, of a nuanced golden-brown colour which shimmers in tone. Facing the brook: there are several outdoor terraces, leading directly into the canteen area. Parking: towards the north a green parking area will be established. There will also be parking options along the edges of the exit road towards the west. Cycle parking: the plan is for bikes to be parked right up close to the building – ensuring easy, direct access to IBA. Inside: when you come in through the main entrance, you can clearly see though up to the floors above. There will be a continuous plant wall, timber-clad elevator shafts, and several ‘market places’ throughout the building. 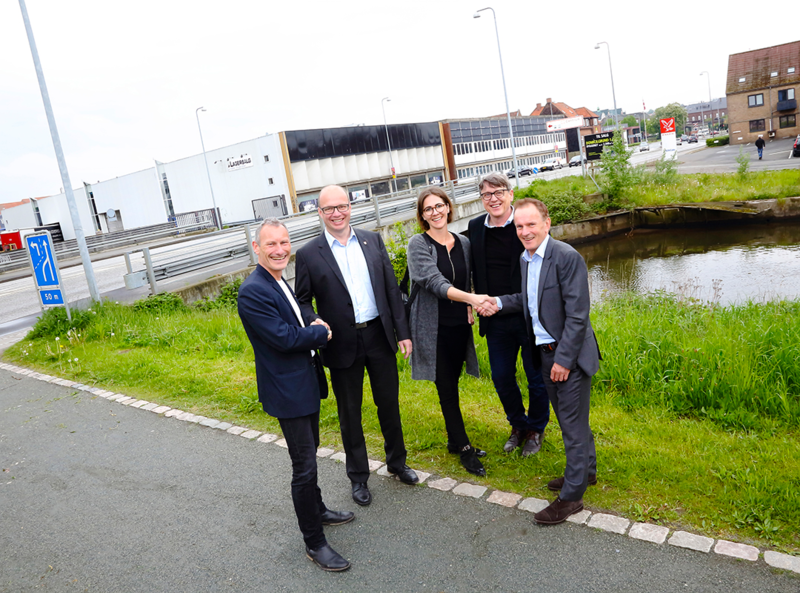 - As Mayor, I’m really happy that we’ll be getting such a distinctive and attractive building, in an area of Kolding that’s been so neglected for so many years, said Jørn Pedersen, who, as well as being mayor of Kolding Kommune, is chairman of the board at IBA. - As an educational institution, IBA has a substantial presence in Kolding. And now at long last they’ll be getting the building they deserve. Today, a white warehouse building stands at the exact spot on which the new IBA will be built – as seen in the photo, above. This building will be demolished in the Autumn. Department Head Palle Priska, from contractors Hoffmann in Fredericia (on the left, above, in blue suit jacket), expects his team to start work on the newly-cleared ground as of February 2017. Here he can be seen shaking hands with mayor Jørn Pedersen. The architects behind this striking design are Janne Brønden (shaking hands with IBA President Niels Egelund in the photo) and Peter Sand, from Kjaer & Richter in Aarhus – who’ve been hired by Hoffmann from Fredericia, who hold the general contract for the project. - The spacious building looks like a dice which has been thrown and which has landed slightly off-kilter, describes architect Katja Viltoft, one of the expert judges on the decision panel. - When you’re young, the most important thing is to see and be seen. You want to be able to keep an eye out for potential boyfriends or girlfriends. And you’ll certainly be able to do that in this new building, with so many open spaces and meeting points, she explained to the guests at the reception. There were five proposed bids for IBA’s new building design. 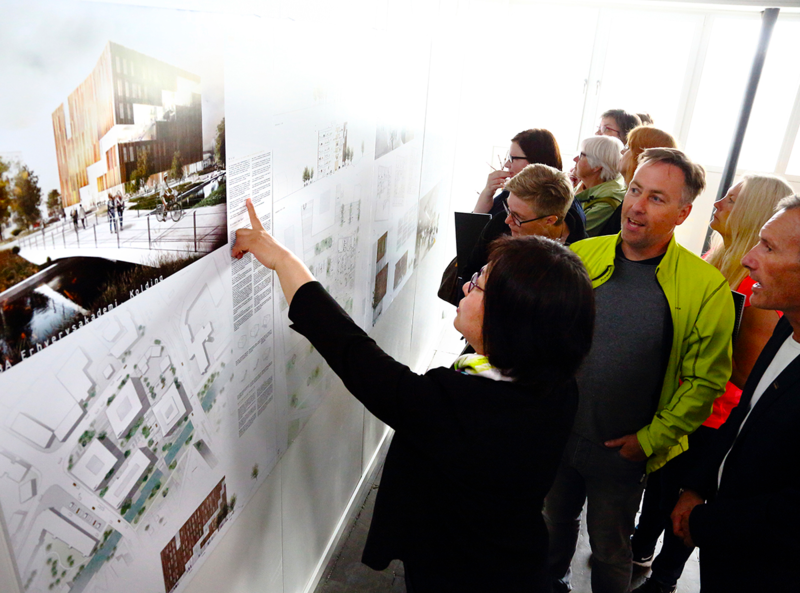 On Tuesday 24th May, the panel announced which one they’d chosen as the winner, before showing off the winning drawings and designs. This all took place at a reception ceremony in the current warehouse building at the location. Around 125 of IBA’s curious employees got the chance to take a look at how their new workplace is set to take shape.